Knowing I was going to have to come up with something fast (or ban all visitors including the UPS guy) my friend Tracey bestowed me with her all-purpose cleaning recipe. Tracey is a homesteader at heart and having raised four kids, I was confident whatever she recommended would work. But I was skeptical about using anything with a vinegar base because of the smell. “Oh, no.” she assured me. “That’s why you create the concentrate with citrus peel. After that, when you dilute it and add your oils, it does smell like vinegar while you’re using it but the smell doesn’t linger.” And she’s right. It doesn’t. So here’s to you Tracey! Thank you for helping me, our dog and my readers detox their homes while creating that sparkle we all love. White distilled vinegar – either the household extra strength kind or the kind used for pickling/cooking, don’t sweat it, they both work well. 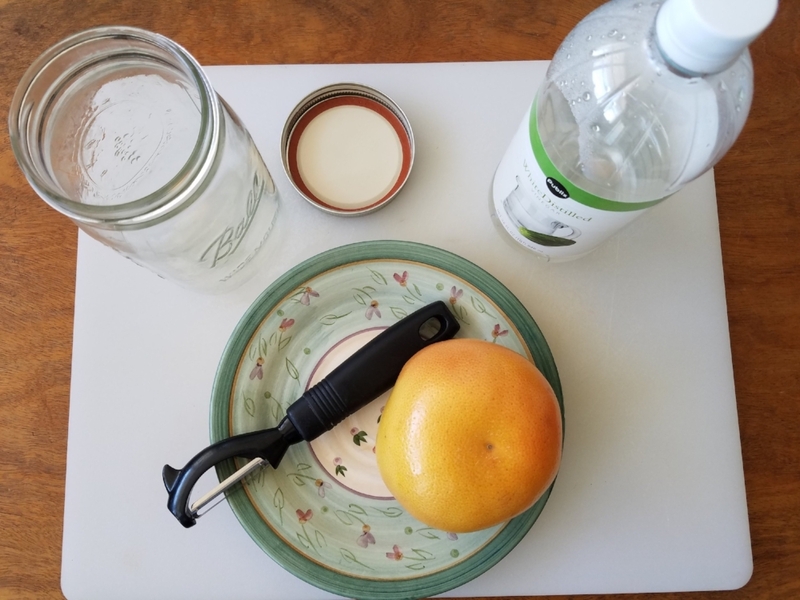 Peel the rind from your citrus fruit and place it in the jar you’ll be using. I find that for my fairly grimy house I need about a 1:4 solution (which I eyeball) of cleaning concentrate to water. Start with that and see how it goes, if you need something stronger, add more concentrate. Using a funnel, pour your concentrate into your spray bottle. Fill nearly to the top with water, add your essential oils, put your spray attachment on and shake well. I use about 10 drops total (7 tea tree + 3 lavender) You can add more or less as you prefer. Again, the tea tree is a great base oil to use because it is such a powerful antibacterial. You can refresh your all purpose cleaner with a few drops of essential oils each week. In my house, this works on countertops, floors, windows, bathroom surfaces. It’s a grease cutter and leaves a great shine. I do not use it on wood. It’s safe for me to use, it works better than any commercial “green” product I’ve tried, my husband, who hates the smell of vinegar, doesn’t grimace when I use it, in fact he uses it and swears by it, I do not panic when our dog licks the floor, and lastly, it’s made me more inspired to clean (which frankly is a little scary). Here’s to happy and healthy cleaning!